Welcome to the Snowy Mountain Alpine Tours blog. We are a backcountry adventure travel company that delivers guided backcountry skiing, hiking, avalanche safety training and mountain skills clinics in British Columbia and Alberta, Canada. Our base of operations are the communities of Blue River and Clearwater in the beautiful North Thompson Valley, fortunately situated smack dab between the Cariboo and Monashee Mountains. 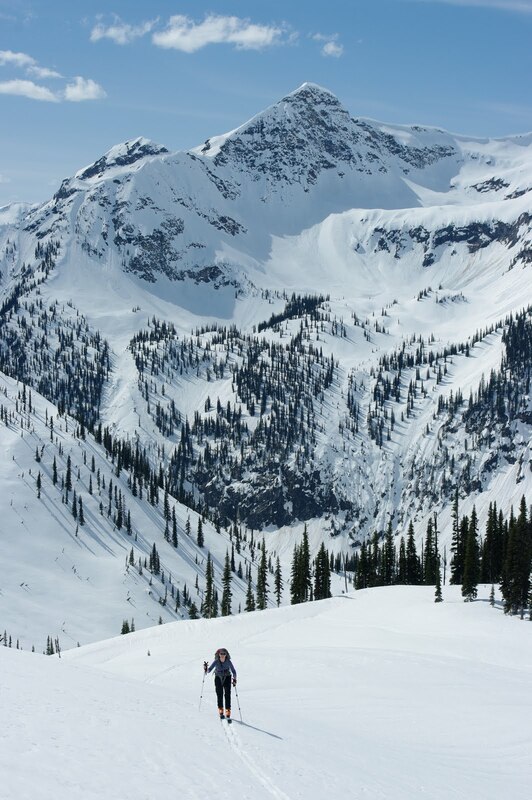 We are very pleased to announce BC's newest and largest backcountry skiing venue and the first guided backcountry ski operation on crown land in the Cariboo Mountains! The tenure sits at the eastern edge of BC's fourth largest protected wilderness area, Wells Gray Provincial Park. Our backcountry chalets will support wilderness skiers and hikers in Rustic Luxury. These accommodations provide access to over 100 square km of mountain terrain. The Cariboo mountains possess the highest concentration of many things "wilderness" including very, very deep and dry powder snow. At a higher latitude than most other BC backcountry lodges this area possesses unique Old Growth tree skiing forests in huge amounts. Picture 30m spacing between trees that were born before your great, great, great, great, great (you get the picture) uncle, the perfect incline for deep powder and a 4.0 m settled snowpack. There is no touring on the flats here to get to the goods either, each chalet (think hut to hut) is placed carefully, to take advantage of direct access to bread and butter runs. Wells Gray Provincial Park..backcountry skiing? Until now there has been essentially no easy access to the goods. Being situated along the eastern boundary provides groups access to huge areas of unskied wilderness including the Wavy Range. With no recorded ski touring exploration here you are guaranteed to have fun! Summer here is incredible, the alpine and sub-alpine zones contain a vast area of alpland, hundreds of lakes and glaciers that beckon for exploration. Even though we live here, we have only scratched the surface of this magical wilderness area. Oh! Did I forget to mention that the forests are also protected from harvesting for Mountain Caribou habitat...thanks to the BC Liberal government! You gotta love it!